Ahhhhh! Memorial Day. American’s like to celebrate this holiday once a year. From parades to cooking on the grill, most U.S. citizens like to take the day off and enjoy life with their families. However, you might be surprised to find that it’s also a fabulous time to escape everyday life for a vacation to the Caribbean. So, throw away those hot dogs and burgers, and come take a look at 25 great choices for Caribbean Resorts for Memorial Day. Starting off our list of the best Caribbean Resorts for Memorial Day is Sandals Emerald Bay. 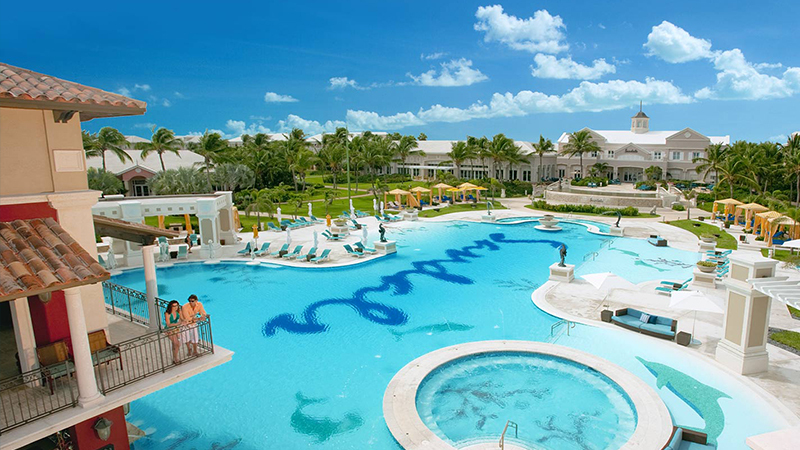 On Great Exuma Island, this all inclusive resort offers a luxurious setting with a feeling of complete seclusion. Though its location may be somewhat remote, this small destination is designed to insure that you’ll feel like you’re the only ones there. Highlights included: an 18-hole golf course, three pools, a 150-slip deepwater marina, unlimited scuba diving and the Red Lane Spa. With romantic fire pits, quiet pools, activities like diving, and entertainment, this resort is ideal for singles and couple. So, tee off, dine out, and live it up in an unforgettable, truly unique and stylish Bahamian environment. 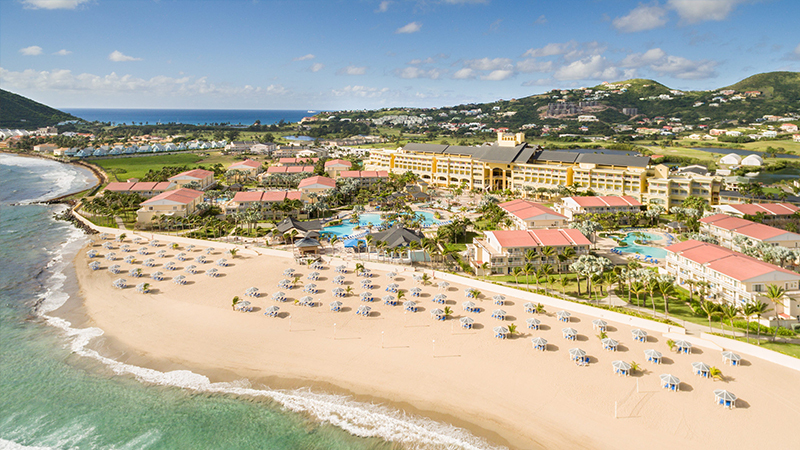 An inspiration in an island paradise, the St. Kitts Beach Club is a spectacular oceanfront resort that surrounds you with the intoxicating beauty and natural treasures of enchanting St. Kitts. First-class amenities are yours to enjoy from private balconies, rejuvenating spa services and delectable restaurants. Discover a handful of facilities — including a large pool complex, a pristine beachfront, an elegant casino and the Royal St. Kitts Golf Club, all giving left little reason to leave the resort grounds. This undiscovered island paradise is quickly becoming the jewel of the Caribbean and making our list of the best Caribbean Resorts for Memorial Day. Excellence Punta Cana is one of the best luxury all inclusive destinations in Punta Cana that boats a 30-mile stretch of palm-lined coast. Here, five-star luxury reigns and romance rules. Adults only here, which makes it is a romantic getaway for couples that want a different kind of vacation. Excellence offers moonlit horseback rides on the beach and live stage shows. 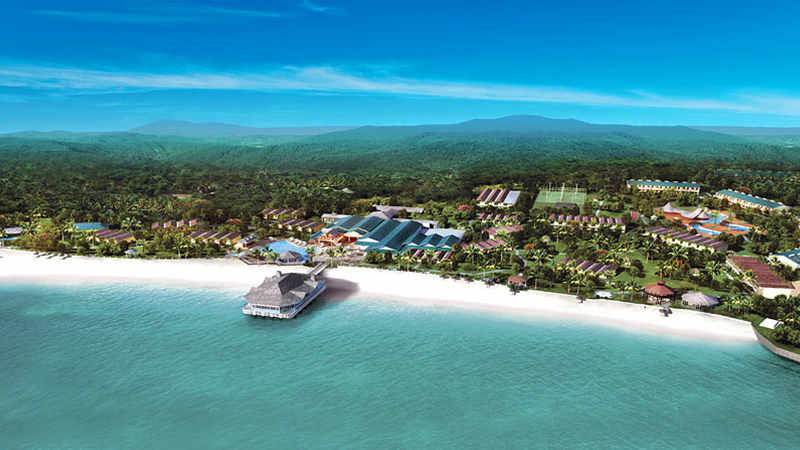 It also provides the perfect playground with two giant pools including swim-up bar. Take your choice of 12 bars and 10 gourmet restaurants, where you’ll surely find something for everyone. 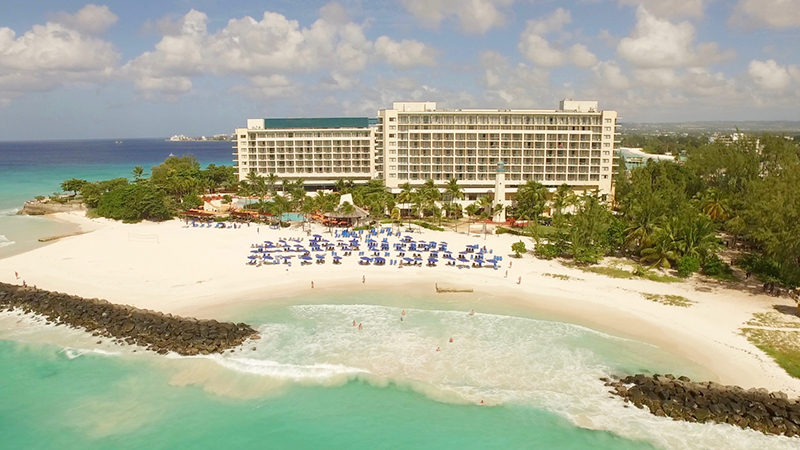 Set on a beautiful peninsula while boasting one of the most spacious beaches on the island, you will find the Hilton Barbados Resort. Get free access to all the snorkeling gear, kayaks and boogie boards needed to explore this spectacular aquatic environment. Parents can perfect their backhand at one of the three tennis courts while the children will have a ball at the Kidz Paradise Club. Soothing massages, rejuvenating facials, manicures and pedicures are on the menu at their full-service spa. Meals can be enjoyed with views of the ocean with the Hilton lighthouse as the backdrop then make a stop to the The Careenage Bar, which has a fun laid-back Caribbean vibe. 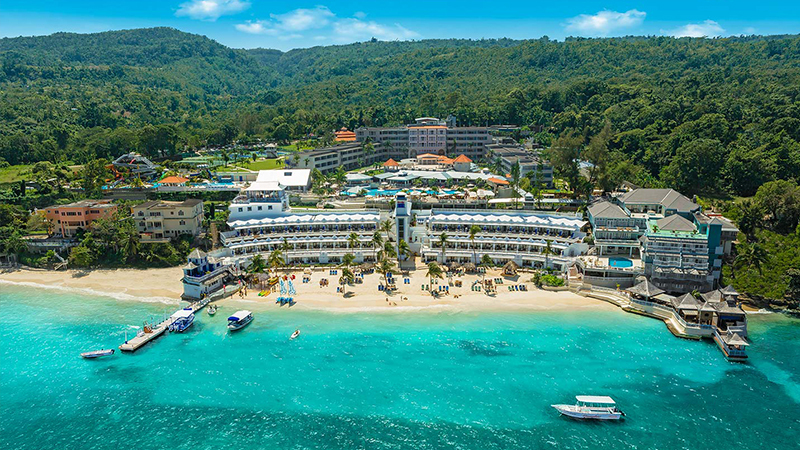 Beaches Ocho Rios is an all inclusive resort that has something for everyone in the family. Twenty-two acres of lush tropical gardens, a gorgeous private white-sand beach, seven gourmet restaurants, a dedicated scuba practice pool and an entire ocean of watersports are all to explore. Kids will absolutely love Pirates Island, which is is a fantasy world filled with gigantic waterslides, kid‐friendly pools and lazy river journeys, as well as the Caribbean’s only surf simulator. This Beaches is also home to some of the most challenging golf in the Caribbean on our their own course in Jamaica. A great choice if your family is looking for one of the best Caribbean Resorts for Memorial Day. Perfectly placed on famed Palm Beach, Marriott’s Aruba Ocean Club welcomes you to the magical island of Aruba leading to an oasis of calm and luxury. Bask in the sun on the white sand beach, go for a swim in the winding pools, soak in the landscaped whirlpool, challenge yourself in the fitness center or play some tennis. Indulge in pampering massages, facials, beauty and body treatments at the full-service spa. When the evening comes around, relax over delicious dining and enjoy the beautiful views. Couples Sans Souci Resort is all inclusive and focuses on the understated elegance of an island escape. 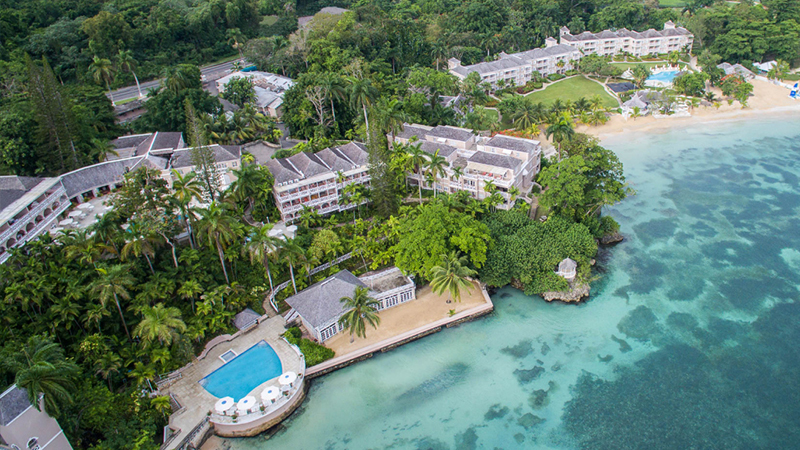 Known as the “Jewel of Jamaica,” this luxurious hotel blends old world glamour with modern style. Highlights include three restaurants, four bars, four pools (including a mineral spring pool), two beaches, and plenty of additional features and activities Explore the coral reefs, play a round of golf, take a professional tennis lesson, or sail into the sunset. Feel a rush of exhilaration at Dunn’s River waterfalls, or simply fall asleep in a hammock by the sea. 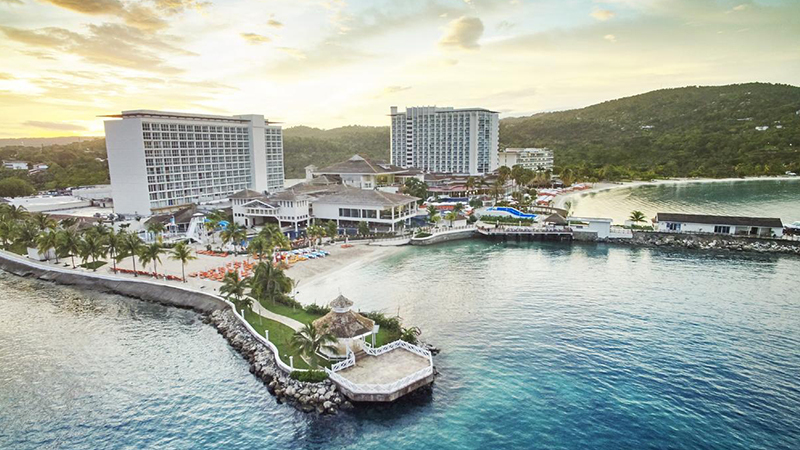 This is the vacation experience you’ve been dreaming about and you can see why it makes it to our list of the top Caribbean Resorts for Memorial Day. 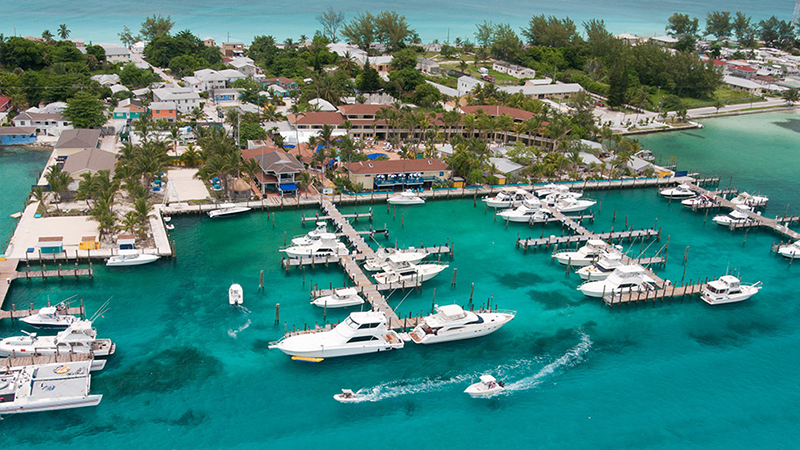 Choose your perfect vacation escape at the Hilton At Resorts World Bimini. Take your hand in fun-filled adventures like snorkeling, parasailing and glass-bottomed boat trips. Try your hand in the boutique casino with 10,000 sq. ft. of table games and 150 slot machines. 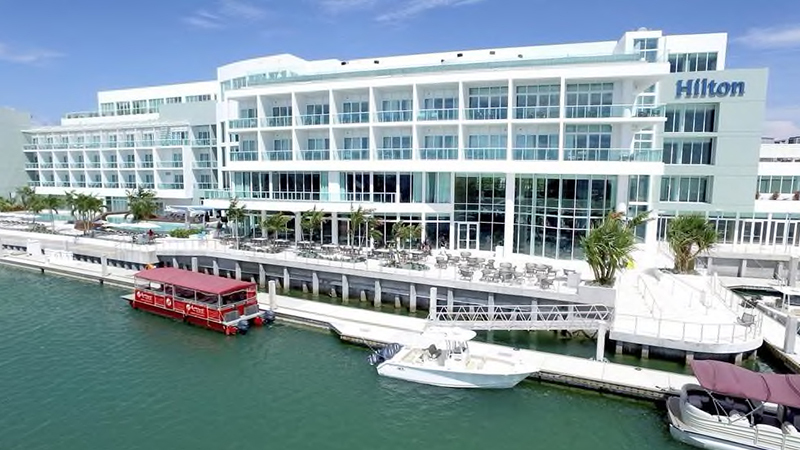 With the largest marina complex in the Bahamas, this Hilton is the center of the Big Game Fishing Capital of the World. Choose from six different on-site dining options. This places certainly shines with its rooftop pool, salon, piano bar and the rejuvenating spa service. The totally cool Hard Rock Hotel & Casino Punta Cana makes our list of the best Caribbean Resorts for Memorial Day. 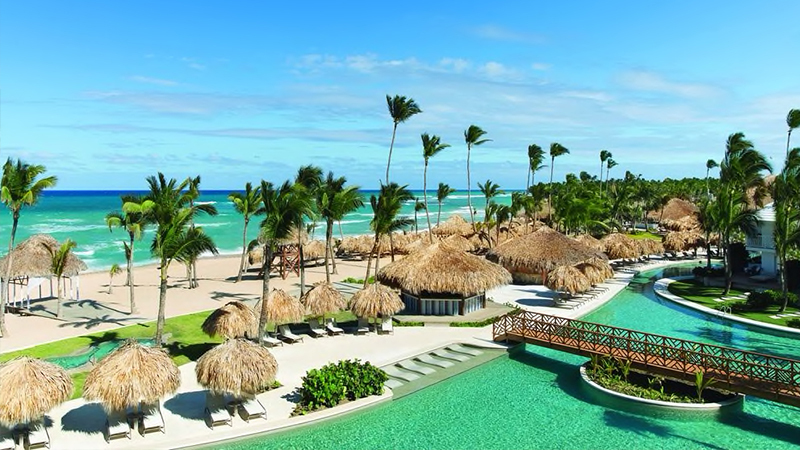 This all inclusive spot brings luxury to Punta Cana on one of the most scenic oceanfront locations in the Caribbean. A mile-long list of activities ensures everyone will find something to keep themselves busy here. Pick from 13 luxurious pools with swim-up bars and water slides to keep you going. If your a fan of golf, tee off at the Jack Nicklaus designed 18-hole golf course. The Rock Spa and Body Rock are the hotel’s spa where you will find treatments from massages to facials. 13 is the number of dining options here ranging from all-you-can-eat buffets, to international a la carte options and everything in between. Not only will you find rock ‘n roll memorabilia here, but make a point to enjoy the concert performances at the on-site theater. 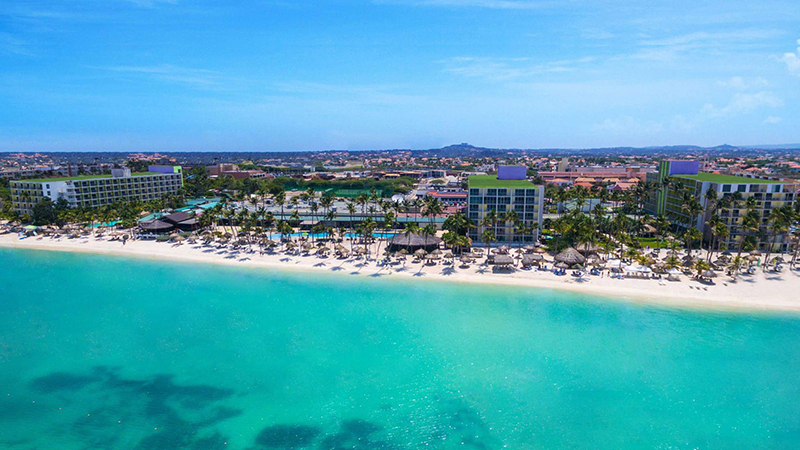 The Hilton Aruba Caribbean Resort & Casino is a beachfront location which overlooks the magnificent Caribbean coastline. This resort shines with two sparkling pools, a beachside spa, scuba diving facility and two lighted tennis court. Make it a great day at the full-service spa while the kids are busy at the Kids Club embarking on loads of adventures. Please enjoy world-class dining at five restaurants then try your luck under a starlit sky at the Las Vegas-style Casino. 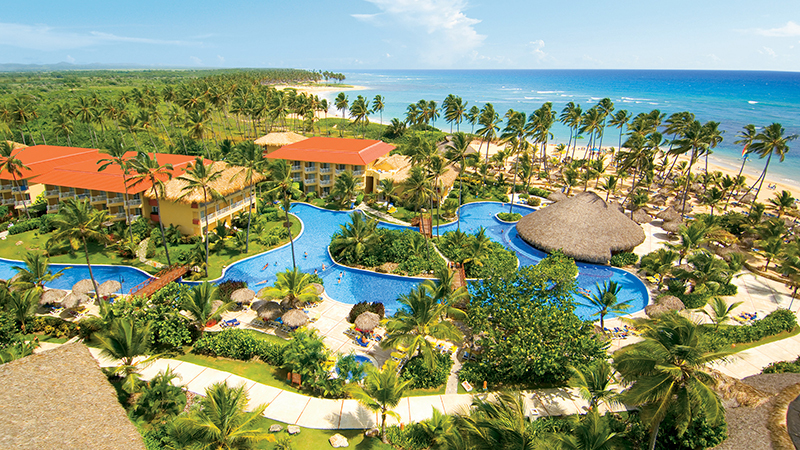 Perfectly located on the east coast of the Dominican Republic, lies the all inclusive Dreams Punta Cana Resort & Spa. It sits on a white-sand beach and offers a long list of features, such as water sports, daily and nightly entertainment and never ending list of kid-friendly activities. You will also discover one of the largest free-form swimming pools in the Dominican Republic, which comes complete with a swim-up bar and venues throughout. Indulge in six a la carte themed dining options, and ten stylish bars and lounges. You will be impressed by the swim-out room then relax in the spa’s Zen garden after a Tropical Oasis Body Wrap. 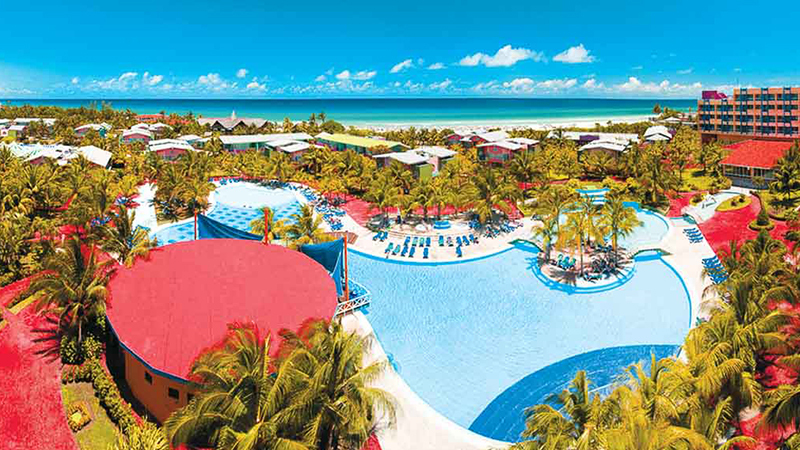 With a sun-kissed beachfront location, the Barceló Solymar offers vacationers an unforgettable Caribbean getaway. 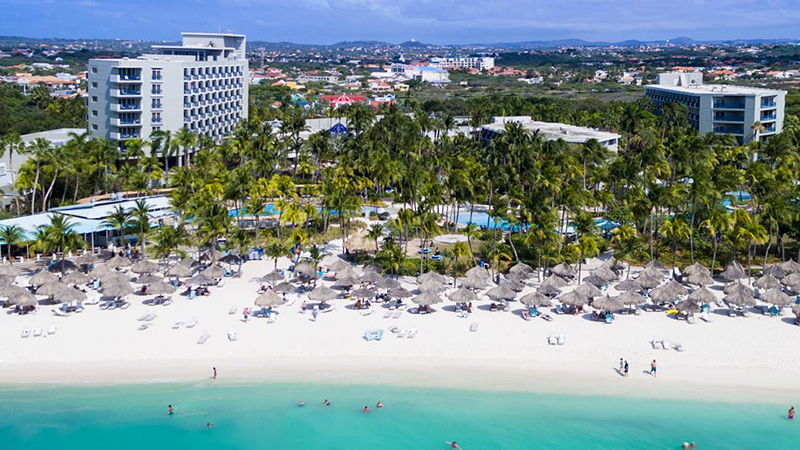 This all inclusive destination is surrounded by lush tropical gardens and features a number of restaurants and bars, three swimming pools, daily and nightly entertainment, and a broad variety of sports and leisure activities. Here you can try both typical local dishes and international cuisine, as it features five à la carte restaurants: Mexican Italian, Asian, Spanish and Seafood. With the exotic scenery and tempting cuisine. You will surely enjoy the rhythm of Cuba here. 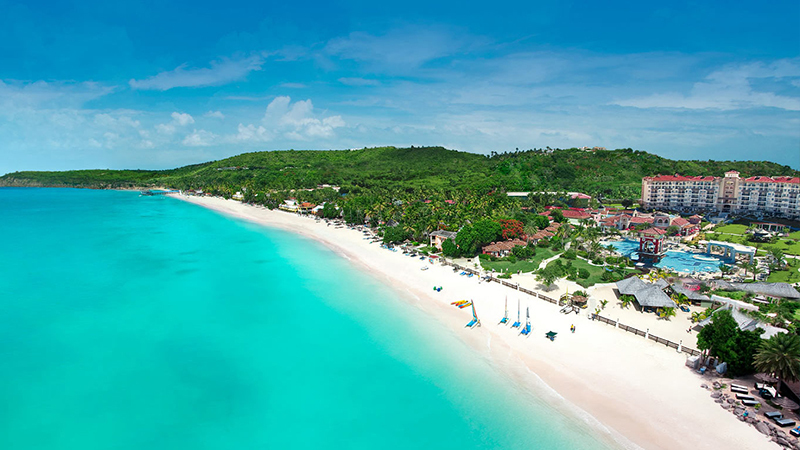 Sandals Halcyon Beach is an all inclusive resort that embraces the quintessential Caribbean. Here you will discover beautifully landscaped grounds with two outdoor pools featuring swim-up bars. This is a smaller, more intimate place compared to the other Sandals. If you’re looking for some activity, take to the water on a kayak, a paddleboard or a sailboat, or explore beneath the waves with some snorkeling right from the beach. The Red Lane Spa offers style massages, facials, body wraps, scrubs and more. Visitors can get complimentary access at two other Sandals Resorts, making the unlimited dining count at an amazing 27 restaurants. Being that it is a Sandals, there is no surprise why it made it to our list of the Best Caribbean Resorts for Memorial Day. 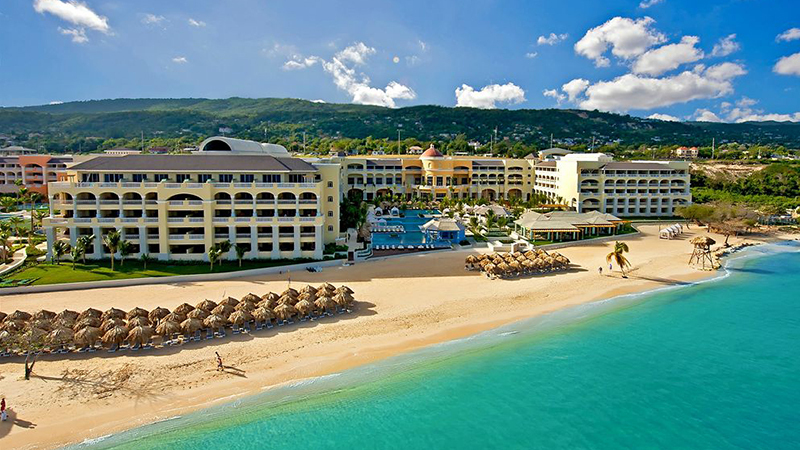 Set on a private beach, Moon Palace Jamaica Grande boasts unobstructed view of the sparkling waters of the Caribbean. This all inclusive family destination comes complete with waterfalls, plunge pools, Jacuzzis, rope bridges, a kids club and a water park that features a huge corkscrew slide. Hop on board for waves of fun at the FlowRider surf simulator or make a stop to the dolphinarium where guests can swim with dolphins. Highlights also include four restaurants, multiple bars, four swimming pools, a world-class spa with 23 treatment rooms and a state-of-the-art fitness center. Meet and mingle with fellow guests at the weekly themed parties then tempt Lady Luck at the Casino. With so many things to do, you can certainly see why we included this in our list of the best Caribbean Resorts for Memorial Day. 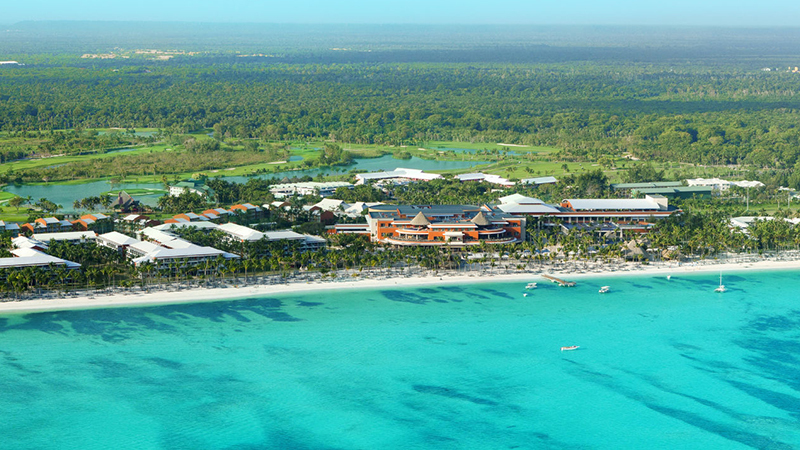 If you’re seeking a resort to see amazing wildlife turtles and flamingoes, make a trip to the Paradisus Punta Cana Resort. Take advantage of unlimited green fees at the Cocotal Golf & Country Club or take a break and indulge in some treatments at the Yhi Spa. You can also take a dip in one of six swimming pools, or hit the beach for some snorkeling or volleyball. Finish the day off with a delicious dining options then stop by for a drink in the Red Lounge. This is a place defined by its love for nature and animals while boasting beautiful lush gardens. 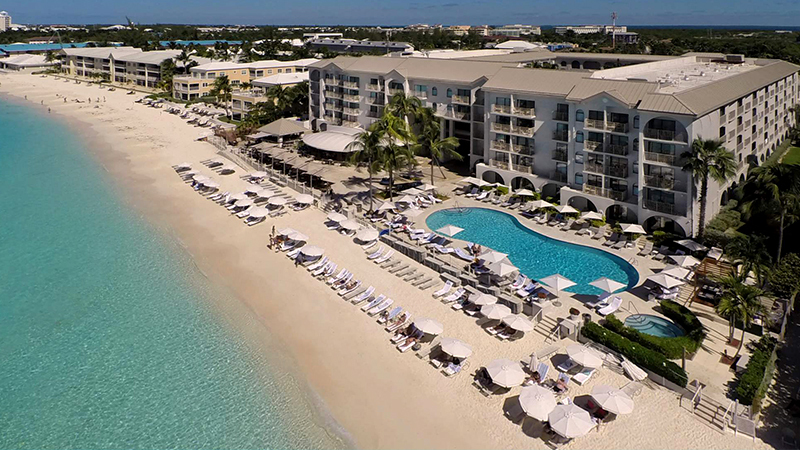 The Grand Cayman Marriott Beach Resort rests on the pristine, coral sands of world-famous Seven Mile Beach. Here you can soak in the sun as you snorkel, swim, paddleboard or jet ski just steps from their doors. Pamper yourself in style at the onsite spa which offers rejuvenating facials and massages. Satisfy your hunger at one of our four restaurants and bars serving international cuisine and cocktails. Kids will love watching the turtles swim in the waterway that winds through the property. Take part in the bonfire nights with cotton candy and smores that will surely create warm memories. 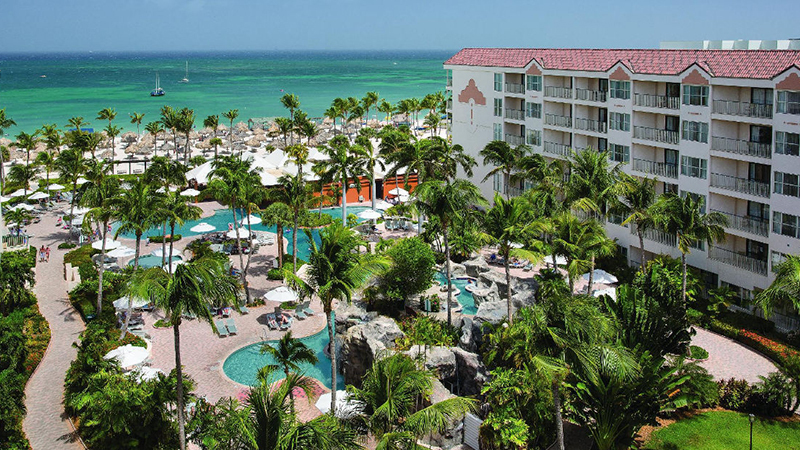 The Holiday Inn Resort Aruba-Beach Resort & Casino, is a beachfront hotel located in beautiful Palm Beach. You will find something for everyone here. This destination is all inclusive, so be sure to take advantage of the dining options and activities to entertain you here. With three expansive pools, fitness facilities, tennis courts and a kids club, this resort truly offers something for everyone. Treat yourself to a rejuvenating spa treatment or go on a shopping spree to the on-site shopping mall. If gambling is more your thing, the Excelsior Casino features blackjack, craps, and poker room. 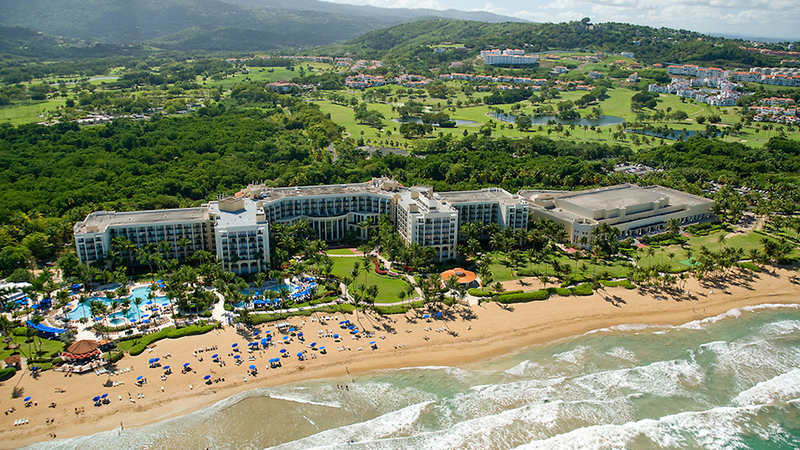 Situated between the El Yunque National Forest and the Atlantic Ocean on Puerto Rico’s northeast coast, rests the Wyndham Grand Rio Mar Puerto Rico Golf & Beach Resort. You’ll find plenty to do here, the resort encompasses two championship golf courses, the River Course and the Ocean Course. With 13 courts, this is largest tennis center in the Caribbean.Bask in the sun at the private white sand beach or chose between two large, lagoon-shaped pools. The Mandarin Spa offers a range of therapeutic treatments and beauty services. Dine on delicious cuisine at the on-site restaurants and bars. At the end of the night, try your luck at the casino which features table games, video poker, and slot machines. 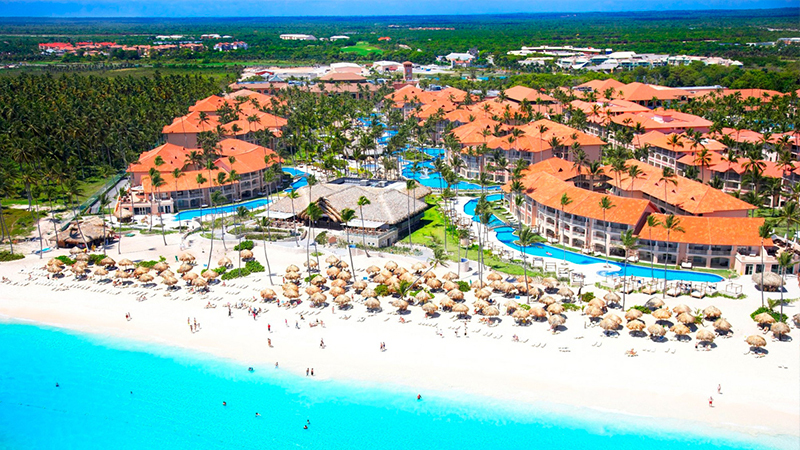 Breathless Punta Cana Resort & Spa is one of the most luxurious all inclusive options in Punta Cana. Relax in a cabana by the beach all day or join the DJ parties by the pool, right at the pool bar, this place is hoping folks! Discover a wide variety of activities including snorkeling, kayaking, sailing or just sit back and relax while journeying through he lazy river. Rejuvenate your mind, body and soul at the Breathless Spa. With 11 dining options, chose from, Italian, Lebanese, French or Pan-Asian, just to name a few. At night, try sipping curated cocktails at eight chic bars and lounges which feature live nightly music and entertainment, dancing and more. The resort also has a small casino if you’re in the mood to play. Voted the “World’s Most Romantic Resort” year after year, Sandals Grande Antigua rests on Antigua’s most famous beach, Dickenson Bay. This adults-only, all inclusive resort ranks high on our list of the Best Caribbean Resorts for Memorial Day. It caters to couples looking for a romantic retreat. Chose between six pools. 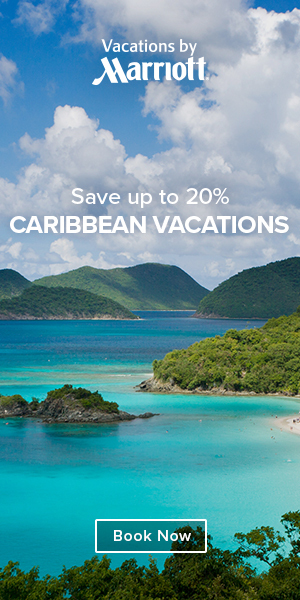 including the Eastern Caribbean’s largest and six whirlpools to chill out a bit. Have your pick of a variety of land and water sports, you can choose to fly across the water ‐ propelled by wind, motor or muscle-power ‐ or try your hand at rock-wall climbing. Red Lane Spa offers treatments like massages and body scrubs for those looking to relax. An array of bars and 11 restaurants are at your disposal, serving everything from pizza to Tex-Mex to sushi. 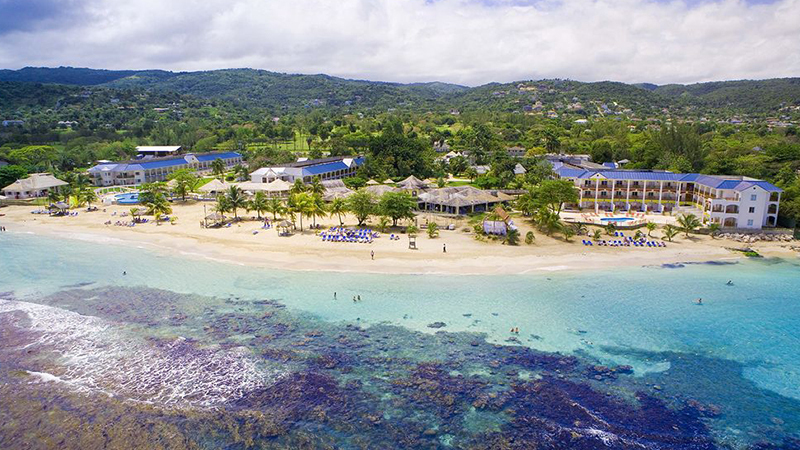 Discover serenity and wellness at Jewel Paradise Cove Beach Resort & Spa at a scenic oceanfront location. Embodying an all-inclusive health, fitness and spa theme, this adult-only getaway invites you to escape and rejuvenate in a vacation setting that truly inspires. Embark on an adventure with numerous land and water sports here. Take a swing at the 72-par, 18-hole championship golf course or Discover a whole new exotic world underwater with their scuba diving program. Seven restaurants will satisfy your cravings with some of the best cuisine in the Caribbean. Located on a thin peninsula next the Caribbean Sea, Secrets Wild Orchid Montego Bay is an all inclusive, adults only resort that shines. Guests staying here will have free flow access to Secrets St. James right next door. Vacationers can choose from a wide array of activities, from windsurfing to bocce ball to yoga. You can also find introductory scuba lesson here or tee off at the five most challenging golf courses only located just a few minutes away. Pick from nine gourmet restaurants, nine bars and lounges. You will also find a theatre features a variety of entertainment and a world-class spa with pampering spa treatments. 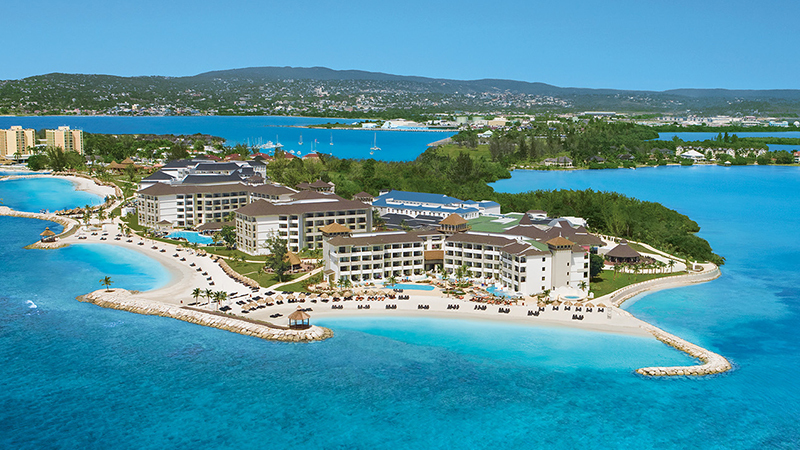 The all inclusive, adults only, Iberostar Grand Hotel Rose Hall sits in a secluded enclave close to Montego Bay. It ranks runner-up on our list of the Best Caribbean Resorts for Memorial Day. Cool off in the four inter-connecting pools or bask on the white sand beach beach. A trip down the lazy river with a cool drink is great for soaking up rays and island vibes. Golfers can enjoy a round of 18 holes at the championship golf course. Anyone looking to relax can explore detoxifying treatments, aromatherapy additions, and spot-treatments at the full service spa. Take your pick of five specialty restaurants, one made-to-order buffet, and a poolside snack bar and grill. 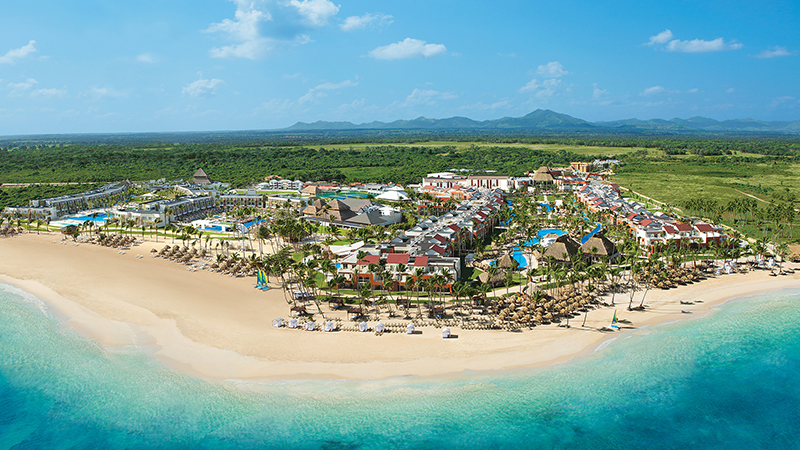 You can also get free access to all three Iberostar resorts’ features, including a total of 15 bars and 11 a la carte restaurants. 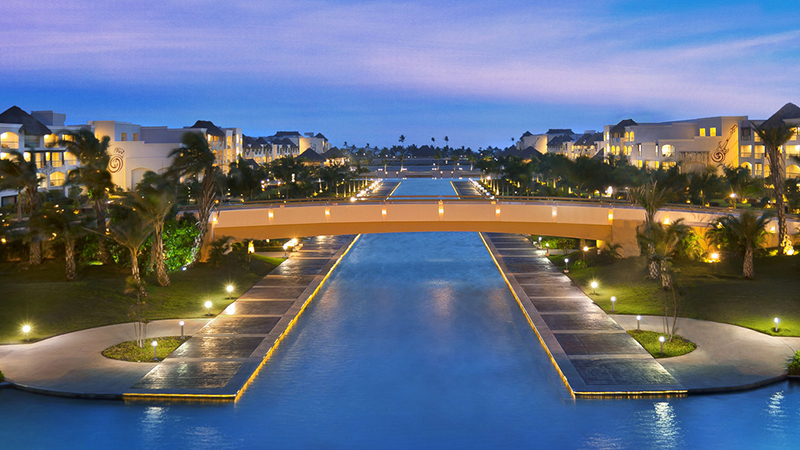 At the top of our list of the best Caribbean Resorts for Memorial Day is Barcelo Bávaro Palace. This all inclusive mecca welcomes you to the clear, calm waters and sugary beaches of Bávaro Beach. The hotel features 4 swimming pools, including one for children, one for adults and a semi-Olympic pool. Relax and let yourself be pampered at the U-Spa. There are many facilities for sports enthusiasts, including a world renowned 18-hole golf course, a fitness center, professional soccer field, baseball field, 18-hole miniature gold and 3 tennis court. You can also take advantage of enjoying water sports such as scuba diving, snorkeling, kayaking, and windsurfing. Pamper your palate at one of eleven delectable restaurants, with cuisine from all around the world. This resort is also home to the most spectacular theatre in the whole Caribbean. If your looking to press your luck, it features a 24-hour casino offering the best gambling destination in the Caribbean. 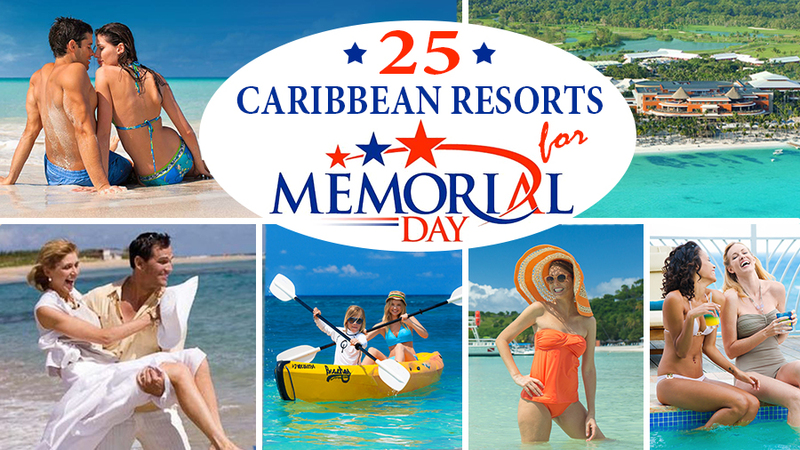 This completes our listing of the top 25 top rated Caribbean Resorts for Memorial Day. We hope we helped you narrow things down a bit of the best places to stay. So, Happy Memorial Day and keep on traveling!